The h2o.TITANIUM is an innovative technology whose efficiency is based on the generation of enormous quantities of hydroxyl radicals (· OH), highly oxidizing agents (only exceeded by fluorine), with a high reaction rate (10e9-10e12 that of O3 ) and whose life is of nanoseconds (space in which they combine or happen to form water again). 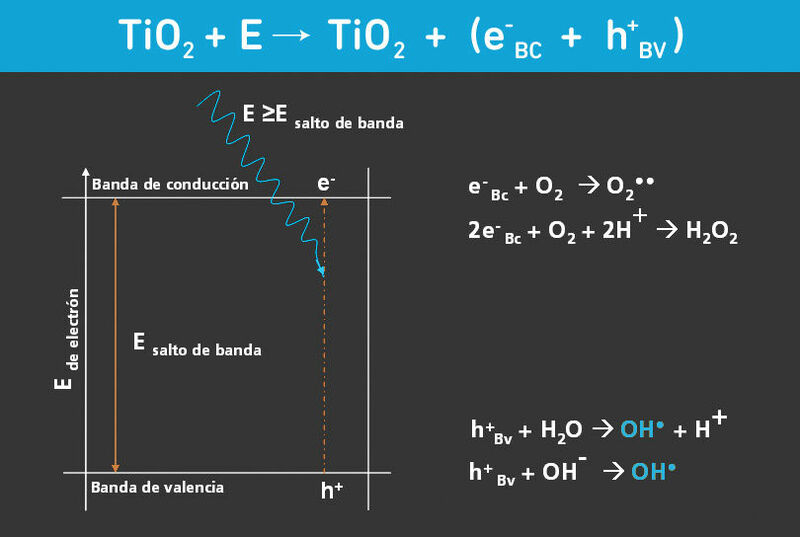 The production process of these hydroxyl free radicals (· OH ) is based on the excitation of titanium dioxide through the application of an energy higher than the band gap energy , so that electron-hole pairs are generated as a consequence of the promotion of electrons from the valence band to the driving band . In the generated electron-hole pairs, the electrons react with water (H 2 O), with hydroxide ions (OH – ) and molecular oxygen (O 2 ) to form the free radical · OH .